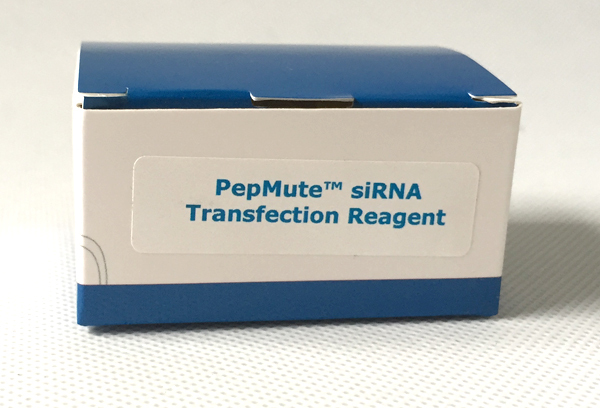 PepMute&trade; siRNA Transfection Reagent, formulated from simulation of virus cell penetrating peptides (CPPs), is a total novel siRNA delivery tool which provides more than 95% silencing efficiency at 1 nM siRNA in variety of mammalian cells. With our proprietary peptide simulation technology (PST), hundreds of viral CPPs were simulated, synthesized and screened for gene delivery efficacy in variety of mammalian cells (Figure 1). PepMute&trade; reagent was then identified and validated as an exceptionally efficient vector for condensing and transfecting short (under 100 bp) single or double stranded nucleic acids such as siRNA, miRNA mimics and DNA oligoes to wide spectrum of mammalian cells. Store at 4 &deg;C. If stored properly, the product is stable for 12 months or longer.